Antivirus Vista 2010 also known as Vista Antispyware 2010, Vista Antivirus PRO, Vista Guardian 2010, Vista Guardian, Vista Internet Security 2010, Vista Internet Security is a rogue antispyware program. It is a clone of XP Antivirus Pro 2010. Antivirus Vista 2010 is installed through the use of trojans. Antivirus Vista 2010 (Vista Antispyware 2010, Vista Antivirus PRO, Vista Guardian 2010, Vista Guardian, Vista Internet Security 2010, Vista Internet Security) reports false infections and shows a lot of fake security alerts as a method to scare user into purchasing the full version of the program. 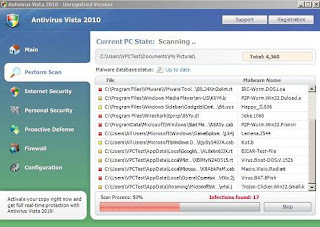 If your computer is infected with this malware then use the Antivirus Vista 2010, Vista Antispyware 2010, Vista Antivirus PRO, Vista Guardian 2010, Vista Guardian, Vista Internet Security 2010, Vista Internet Security removal instructions.